If you've ever said to yourself, "I can't stand my body!" or felt like other kids were making fun of your weight, The Ultimate Weight Solution for Teens may be the diet plan for you. 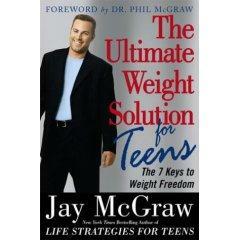 Jay McGraw, son of television advice guru Dr. Phil McGraw, has developed a weight loss management plan designed just for teens. Overweight or obese teens face a variety of challenges. They often endure horrendous teasing and name-calling at the hands of their slimmer peers. They may suffer from depression as a result of a poor body image. If they're trying to lose weight, they must cope with the stress of being surrounded by pizza, candy bars, hamburgers, cheese fries, and other unhealthy dietary choices. The Ultimate Weight Solution for Teens shows you how to overcome these issues to reach your weight loss goals, improve your overall physical health, and increase your sense of self-esteem. As you may have already guessed, Jay's weight loss plan was inspired by the success of his father's bestselling book. In The Ultimate Weight Solution, Dr. Phil outlines seven keys to weight loss freedom. Jay's plan adapts these important concepts to the needs of a teenage audience. Like his father, Jay believes the key to weight loss is understanding one's thoughts and feelings. Using real-life examples drawn from interviews with over 10,000 teenagers, he encourages readers to examine their relationships with food and find the cause of their overeating. "Weight is not about the size of your Levis or a number on the scale," he writes. "It's about whether you use food to take care of your body or to abuse it." While Jay is not a licensed therapist, he has become well-known for his ability to discuss difficult topics in a manner that is accessible to a teenage audience. His previous books, Life Strategies for Teens and Closing the Gap, were also bestsellers. Unlike many other diet plans, The Ultimate Weight Solution for Teens understands the unique needs of a younger audience. For example, Jay doesn't suggest avoiding fast-food restaurants. Since he knows teenagers socialize with friends over Cokes and french fries, he has included a section that discusses the most nutritious menu choices in McDonalds, Burger King, and other popular dining establishments. Instead of recommending a restrictive diet, Jay promotes a philosophy of moderation and responsible eating. As a teen, you are exposed to media images of super-thin celebrities on a daily basis. Many girls become depressed when they realize they can't look like Britney Spears or their favorite fashion models. Many boys give up their weight-loss efforts when they discover it's unrealistic to develop the physique of a professional athlete. The Ultimate Weight Solution for Teens encourages readers to develop a positive self-image and a realistic expectation of what their bodies should look like. Since Jay understands that teenagers have an innate desire for rebellion, his book avoids nagging and dictating. His goal is to help readers learn to solve problems on their own. The overall message is one of empowerment, not punishment. Weight loss isn't easy at any age, and Jay McGraw recognizes and addresses the special needs and challenges that confront teens. In an easy-to-understand format, he makes it clear that you won't have to give up all the foods you love, but you will have to learn how to live within boundaries. The process isn't always easy, and it's one you'll have to work through yourself, but with Jay McGraw's guidance, you can do it.